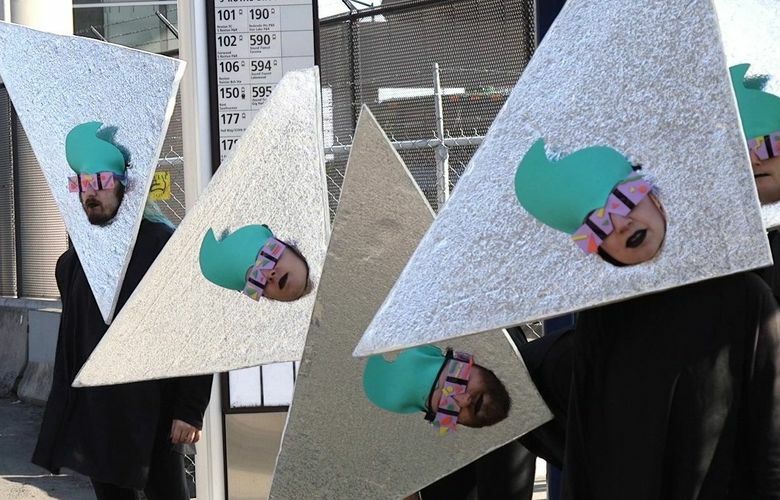 The future arrived in Seattle this spring, and it included art. The just-opened, swift and spiffy light-rail extension from downtown Seattle, under Capitol Hill and on to the University of Washington is embellished with artworks that are appropriately forward-looking, urban and energetic. 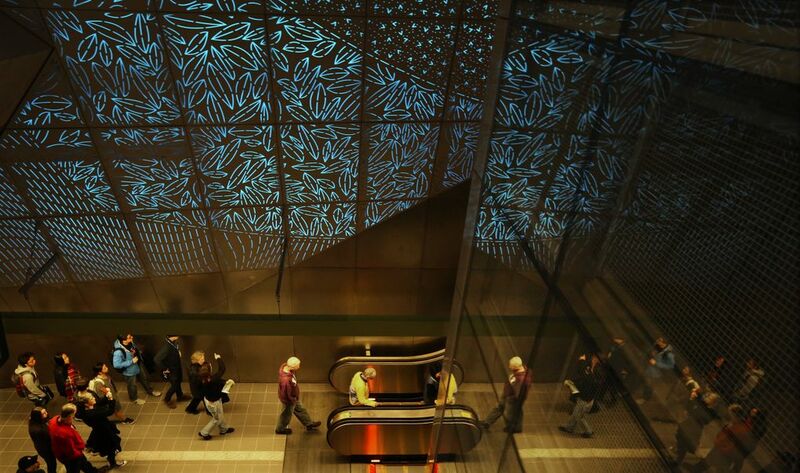 The best of the pieces, the University of Washington station’s “Subterranium,” by Seattle sculptor Leo Saul Berk, transforms a significant portion of the station’s environment, giving a cinematic spin to the simple act of going from here to there. 5 a.m.-1 a.m., Mondays through Saturdays, 6 a.m.-midnight Sundays and holidays at Capitol Hill and University of Washington Link light-rail stations (140 Broadway E. and 3720 Montlake Boulevard N.E. ); Seattle, Orca pass or ticket required (soundtransit.org). To best appreciate Berk’s installation, stand at the railing just inside the UW station and watch travelers taking the long escalator ride to the tracks far below. The escalators descend through a darkened, 110-foot-tall chamber, whose lively centerpiece is a free-standing glass elevator shaft, with a brightly lit elevator rushing past at regular intervals. Most of the light is provided by Berk’s colossal, illuminated walls and ceiling, with 553 backlit aluminum panels penetrated by laser-cut squiggle shapes loosely inspired by the sort of symbols geologists use for rock layers. Taken on their own, the various cutouts — leaves, herringbone, bubbles, cells, tensile structures — are not particularly interesting, but the cumulative effect of many thousands of them lit from behind creates an ethereal blue glow not unlike banks of stained-glass windows, set in a space with roughly the shape and proportions of a Gothic church. The theatrical view down into the escalator shed is also reminiscent of the stylized, underground power chambers featured in science-fiction movies, with endless rows of lights, vertical shafts and vertiginous, suspended walkways skewing off in all directions. Berk’s evocative staging marks the passage into our new underground network as something notable and dramatic. 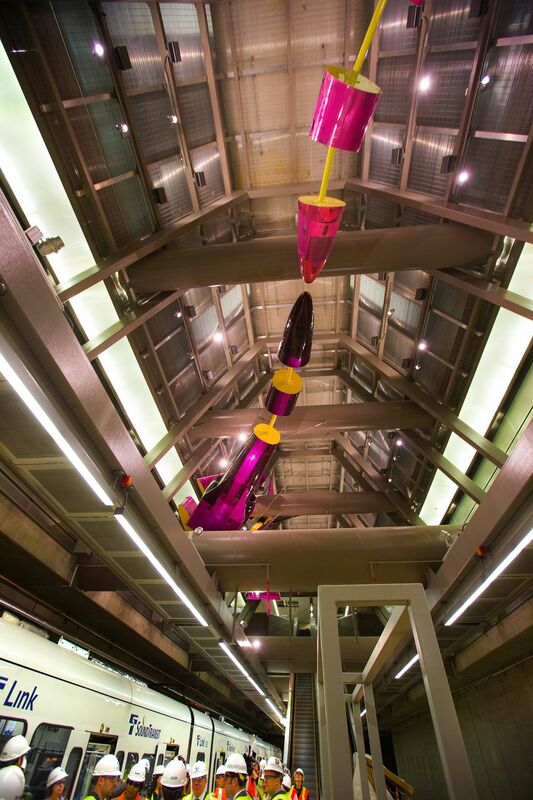 Brooklyn sculptor Mike Ross is equal to Berk in ambition, and his hanging of two cut-up and reassembled Vietnam War-era fighter jets from the ceiling over the Capitol Hill Station arrival/departure platform is nothing if not audacious. Ross made a huge splash at Nevada’s Burning Man festival in 2007 by welding two tipped-on-their ends tanker trucks together, and his Link light-rail commission is a sort of follow-up act, with planes instead of trucks. Like Berk, he is also interested in transformation — in this case, taking the “war” out of the warplane, and turning it into something benign and artistic rather than threatening. To accomplish this, Ross cut the planes into sections like slices of a sausage, and reassembled the pieces with spaces in between, and added a vivid purple-and-yellow paint job. Unfortunately, the floating wing and body parts don’t read well from some vantage points, and are often obstructed by the surrounding architecture. From the track level, for example, the plane sections suspended overhead seem random, like a mobile assembled in the wrong order. The upside of this disorder is the surprise of seeing the piece from the one location where we have a clear view and things line up — on the escalators to the tracks. Now we get it. Two tail-flipping, hyperextended, one-winged marine mammals (the other wing is folded up due to space constraints) that used to be jets are about to rub noses — hence the work’s title, “Jet Kiss.” Riders smile in recognition. 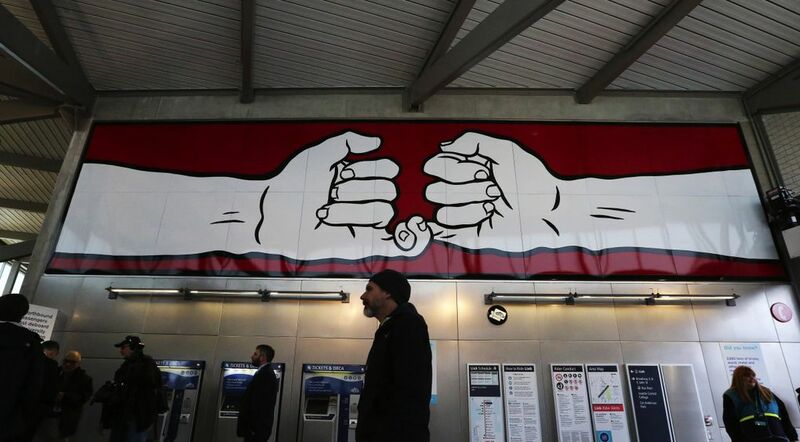 Ellen Forney’s billboard-sized cartoon hands at the station’s entrances are a perfect counterpoint to Ross’ jets: They are both goofy and attractive, with gestures that welcome your arrival or mark your departure. Artist, author and critic Gary Faigin is co-founder and artistic director of the Gage Academy of Art.